اندازهٔ این پیش‌نمایش: ۸۰۰ × ۵۲۵ پیکسل. کیفیت‌های دیگر: ۳۲۰ × ۲۱۰ پیکسل | ۶۴۰ × ۴۲۰ پیکسل | ۱٬۰۲۴ × ۶۷۲ پیکسل | ۱٬۲۵۰ × ۸۲۰ پیکسل. 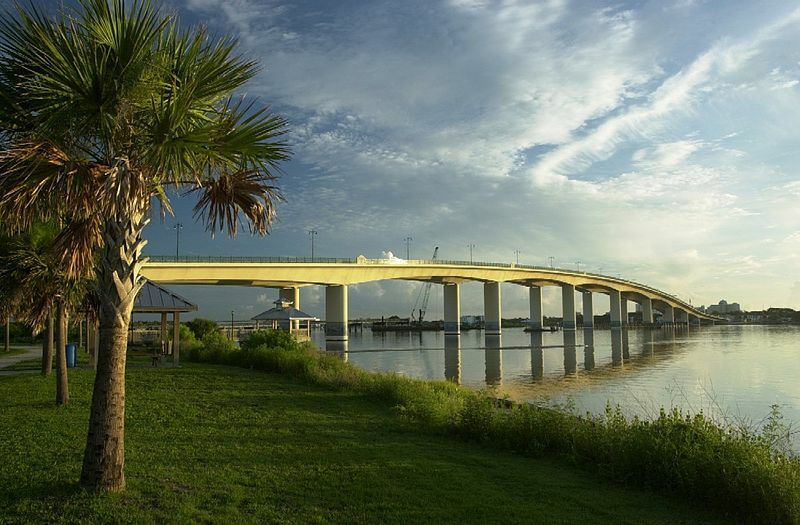 English: The New Broadway Bridge in Daytona Beach features tile mosaic panels depicting native Florida wildlife along the special handrail of the sidewalks. This work was created by a government unit (including state, county, and municipal government agencies) of the U.S. state of Florida. It is a public record that was not created by an agency which state law has allowed to claim copyright and is therefore in the public domain in the United States. Public records are works "made or received in connection with the official business of any public body, officer, or employee of the state, or persons acting on their behalf, [which includes the work of] the legislative, executive, and judicial branches of government and each agency or department created thereunder; counties, municipalities, and districts; and each constitutional officer, board, and commission, or entity created pursuant to [Florida] law or [its] Constitution" (Florida Constitution, §24) such as a work made or received pursuant to law or ordinance or in connection with the transaction of official business by any state, county, district, or other unit of government created or established by law of the State of Florida (definition of public work found in §119.011(12), Florida Statutes). Works by defunct state agencies may be copyrighted if these rights were transferred to a new or different agency (note that legislation transferring such right may not have been codified into Florida Statutes). For example, copyright in works by the Florida Space Authority may have been transferred to Space Florida. State and municipal government agencies may claim copyright for software created by the agency (§ 119.084, F.S. 2014). In case law, Microdecisions, Inc. v. Skinner—889 So. 2d 871 (Fla. 2d DCA 2004) (Findlaw)—held that the Collier County Property Appraiser could not require commercial users to enter into a licensing agreement, holding that "[the agency] has no authority to assert copyright protection in the GIS maps, which are public records." Note: Works that are considered "public records" but were not created by a state or municipal government agency may be copyrighted by their author; the Supremacy Clause of the United States Constitution prevents state law from overriding the author's right to copyright protection that is granted by federal law. For example, a state agency may post images online of the final appearance of a building under construction; while the images may be "public records", their creator (eg. architecture/construction firm) retains copyright rights to the image unless the contract with the agency says otherwise. See: Government-in-the-Sunshine Manual: To what extent does federal law preempt state law regarding public inspection of records?.